Speech Debelle returns with the second single from her eagerly awaited debut album, "Speech Therapy." "The Key" shows a slightly different side to Speech's character. Where "Searching" seemed introspective and fragile, Speech uses "The Key" to display a little more swagger, delivered in her unique voice, her own unique style, both youthful and old beyond her years. Not for nothing are people talking of this South Londoner as the most exciting new voice coming out of UK black music in years. 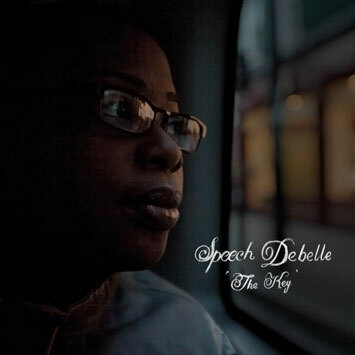 "Check the paragraphs - speaking in parables…"
Speech Debelle returns with the second single from her eagerly awaited debut album, "Speech Therapy." Already played by Huw Stephens on Radio 1, on the very day he received the mp3, "The Key" shows a slightly different side to Speech's character. Where "Searching" seemed introspective and fragile, Speech uses "The Key" to display a little more swagger. Over a swinging acoustic bass and a chorus of clarinets, Speech demonstrates examples of "ovastanding" - getting to grips with reality as-is without being ground down or made bitter by it. First she addresses a former friend who is "bright like me/ The only real difference is you slyer than me." Despite a serious 'difference of opinions' (! ), Speech now sees the girl for what she is (strengths as well as weaknesses), holds no grudge and wishes her well. On the second verse she extrapolates out from this one story into a more generalised comment on society: "And remember they hate to see you smile,/ Your unique style, you're everything they're not"
All of this is delivered in Speech's unique voice - her own unique style - both youthful and old beyond her years. Not for nothing are people talking of this South Londoner as the most exciting new voice coming out of UK black music in years.